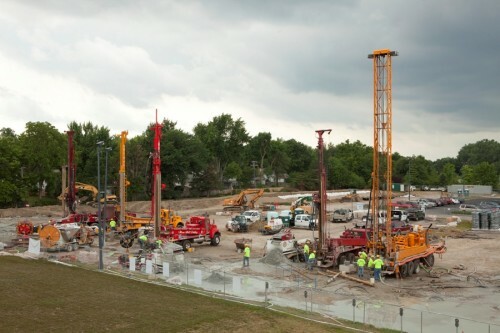 Ball State University in Indiana has recently begun the second and final phase of what will be the largest geothermal heating and cooling system in the United States. The project, which began in 2009, intends to replace four coal-fired boilers along with two smoke stacks. During phase one of construction, the North District Energy station was built, along with two geothermal energy fields, while connecting north-end buildings to the new system. After the first phase of construction, almost half of the Indiana-based campus now receives heating and cooling from the new geothermal system. The eventual goal is to link up 5.5 million square feet of geothermal heating and cooling across Ball State University. The project has been a boon to supporting renewable jobs in the state of Indiana, creating 2,300 indirect and direct jobs, according to Ball State’s Center for Business and Economic Research. Both federal and state financing helped fund the costs of the $50-million project. The US Department of Energy provided $5 million in stimulus money, while the Indian state government provided $45 million in capital funding for the project. Increased costs of maintaining a fossil-fuel-based heating and cooling system, along with a more sustainable outlet, were some of the reasons for the switch. “When costs began to escalate for the installation of a new fossil fuel burning boiler, the university began to evaluate other renewable energy options,” Jim Lowe, director of engineering, construction and operations, said in a statement. The school expects to save $2 million in operating costs, while cutting carbon emissions on the campus by nearly 50%, thanks to the conversion to geothermal.